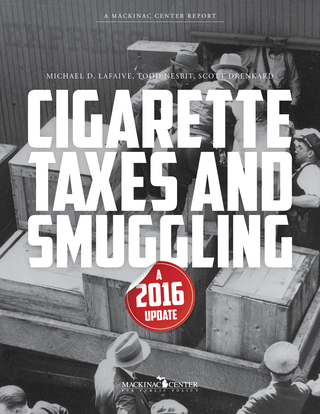 One of the challenges of designing a statistical model to analyze the impact of cigarette taxes on smuggling rates is determining what to count as smuggled. Not all tax avoidance is tax evasion and states differ in how they define smuggled goods. Some states, such as Minnesota, tolerate a modicum of cross-border cigarette shopping. For instance, it wouldn’t necessarily be illegal in these states to purchase cigarettes for your own personal consumption in a neighboring state and then bring them back across the border to be consumed in your home state. States like Michigan, on the other hand, do not tolerate any cross-border shopping and maintains a zero tolerance policy. Possessing one single cigarette stick in Michigan brought in from another state is illegal. It is impossible for scholars to know what percentage of cigarettes brought in from one state to another falls under the legal limit (one carton per month, for example) and the amount brought in that exceeds it. Some scholars identify the total as “diversion” or both “tax evasion and avoidance.” Our statistical model attempts to capture both casual smuggling and commercial smuggling. The statistical model employed in this study is a residual model, designed to compare the published smoking rates of adults in 47 states with legal paid sales of cigarettes. [*] The difference between the amount of cigarettes that are being smoked in the state and what are acquired through legal sales could be explained by some form of smuggling, and this is our assumption. The model also takes into consideration a variety of factors that might impact casual and commercial smuggling, such as proximity to a low-tax state, border county populations and presence of Native American reservations. A complete description of the model and assumptions can be found in the appendix to this study. [*] “North Carolina is excluded from our estimate because it is the source state for our “commercial smuggling” calculations. Hawaii and Alaska were excluded due to the challenges of modeling states that are noncontiguous.